On Easter, April 21 and 22, the LVM Nature Park in Tērvete will hold the first popular event of new season – “The Colourful Easter”. We will have fun, cheer and have creative activities together with the active fairytale characters and will enjoy Easter traditions! At the dwarf town “Čiekure” from 12 noon until 4 PM the mischievous Rabbit will invite to compete in special long-ear sports races. For health and strength don't miss the whipping with willow twigs at the bonfire! However, from 2 PM until 3 PM the big singing together with folklore group “Leimaņi”. On the April 22 at Dwarfs’ Cottage from 12 noon until 5 PM – creative activities in “Do it yourself!” and new knowledge together with Dwarf family’s “Nature Stories of the Great Time”. But at 1 PM both young and old nature friends are welcome to the Easter music making activities together with dwarfs. Entrance in the event with the entrance tickets of LVM Nature Park in Tērvete. Please note that photographs will be taken throughout the event. The most active and fearless ones will be welcomed by the instructors of Skyways of Lucky Land (registration in advance by calling +371 29944079) to test their strength in rope and cable ways up to 10 m above ground. The “Skyways of Luck Land” has separate price list and is not included in the entrance ticket price of the LVM Nature Park in Tērvete! More information (www.facebook.com/gaisatakas/). The Tērvete Butterfly House will begin its new season and open its doors on Easter! Nature friends will be able to see tropical butterflies in all their colourfulness, also witness the process of butterfly transformation in butterfly incubators with their own eyes; to get to know turtles and other inhabitants of the tropical house. The Tērvete Butterfly House is located next to the large car park of Nature Park in Tērvete. Tropical house has its own entrance tickets. For more information call +371 29353571 (www.facebook.com/tervetestaurini/ or tervetestaurini.lv). 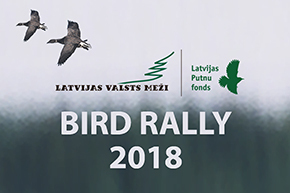 Also, real nature lovers, to stretch their nature experience and to get to know the new trends in tourism, are welcomed not far away from the Nature Park in Tērvete, close to Lithuanian border, in Žagare, to discover and walk the longest swamp trail in Lithuania, 6 km in total – in the Musa tyrelis swamp trails (Mūšos tyrelio pažintinis takas). Musa tyrelis is one of the most outstanding landscape elements in the Zagare Regional Park. Coordinates for the nature trail – 56° 13' 11", 23° 15' 46.8". The LVM Nature Park in Tērvete invites to go into forest, leave the daily routine behind and get joyful emotions in nature!